Hello from the California’s Poor People’s Campaign kick-off in Sacramento! 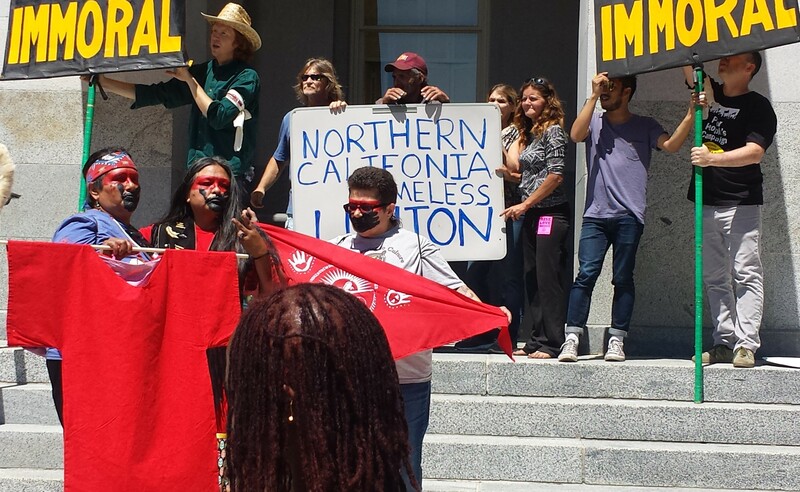 A report-back from May 14 – the first day of 40 Days of Action in Sacramento. By Anne Barron, PRC member. 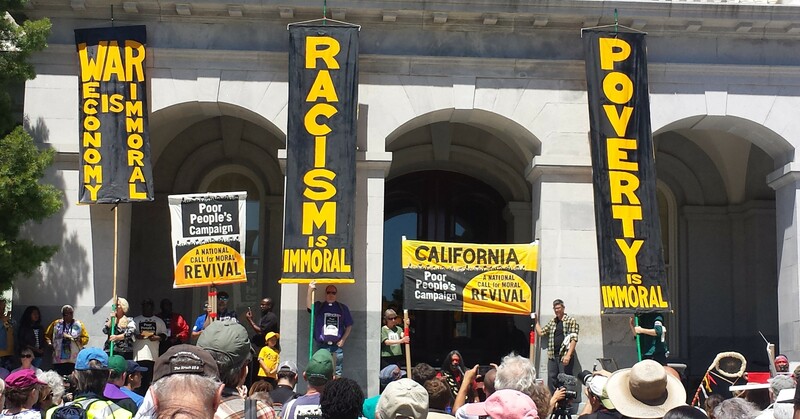 On May 14th, the Poor People’s Campaign (PPC) kicked off here in California and in 42 other states and in Washington, DC with coordinated rallies and direct action to challenge the unjust status quo. Background. The Poor People’s Campaign is a national call for a moral revival – to take back our country from the control of the military-industrial-prison corporations dominating our government. It is a national call to challenge our state legislatures to enact fair and equitable legislation to repair the harm done by injust laws that oppress communities and drain them of their resources and money. It is a challenge to the white supremacy that dominates the cultural, social and economic systems. The PRC endorses the Founding Principles of the Campaign and will be supporting the Campaign here in California. We just got back from the state-wide convergence of the PPC on Sacramento – a great day of training, networking and direct action with folks from Los Angelos, the Bay Area, and Sacramento. I drove up on Sunday with Summit UU member Jack Shu. Thanks to the work of amazing volunteers coordinating the actions, we were able to bunk down Sunday night at a local church just blocks from the capitol. 8:30AM: Introductions, trainings & hobnobbing began. I count over 300 people coming and going during the day. Jack & I sign up as peacekeepers. The Brown Berets de SacrAztlan led our team. Others signed up to serve as marshalls, as supporters for people arrested during the direct action, as first responders for the medical team, etc. 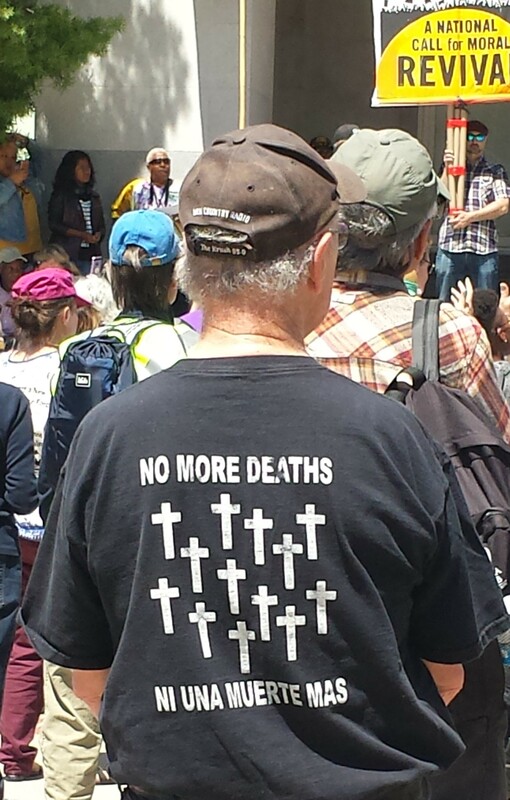 Thirty-five people take on the responsibility of moral witness, placing their bodies in direct confrontation with police during the day’s Non-violent Moral Fusion Direct Action. Reverend Beth Johnson, from Palomar UU, is the state coordinator of the Direct Action Task Force. The morning is a jumble of different trainings, creating art, learning songs, team work to get the art and posters set for the afternoon rally, and general coordination of large numbers of groups from all over the state. 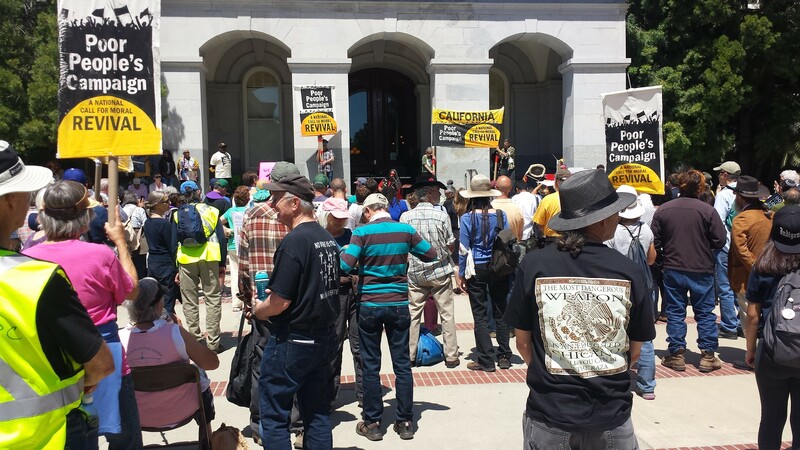 We got to connect again with friends from the LA chapters of the PPC, Veterans For Peace, and also meet up with friends participating in the Immigrant Rights Action that took place the same time at the Capitol steps. Really exciting – meeting LA members of the Global Women’s Strike and the local chaper of WILPF (Women’s International League for Peace and Freedom). I look forward to connecting with these women as we work on supporting the Campaign’s Week 3: War Economy. NOON: We head to the Rally gathering point (the South steps of the Capitol) to set up for the 2 pm Rally, munch on pizza and meet one another. Mini trainings spring up as new people continue to stream in, adding their strengths and enthusiam to the growing Campaign. Indigenous leaders honor the wisdom of the elder as they lead the first chant. Speakers, one after another, testify to the hardships they suffer as Poor People at the hands of systemic economic inquity and discrimination. Lady Liberty glows above the crowd. Reviving her promise to all newcomers to our country. A common dream expressed by one among many in the crowd. The Rally moves onto N St, occupying the intersection. The moral witnesses then occupy the entrances of the Capitol’s underground carport. “No more business as usual.” Not one car in or out. 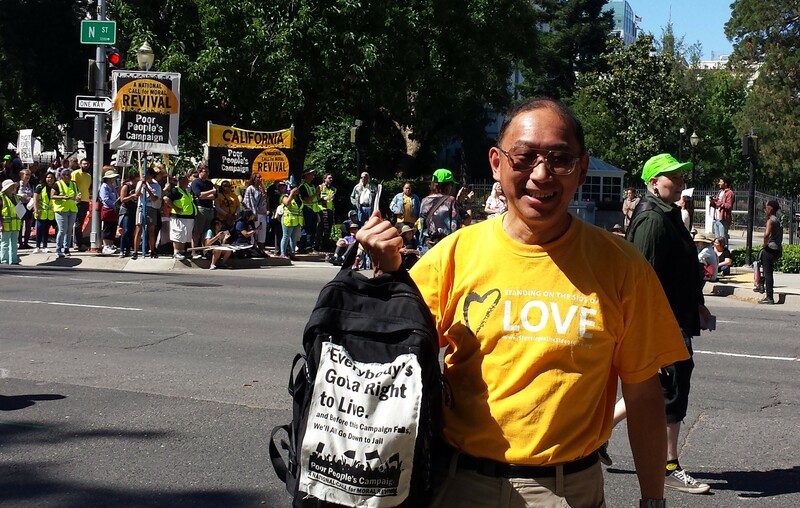 Jack Shu, a Peacekeeper, shows his love during the Direct Action. 4:30PM: Direct Action disperses as police hold back. No arrests. The Campaign pledges to return again next Monday. 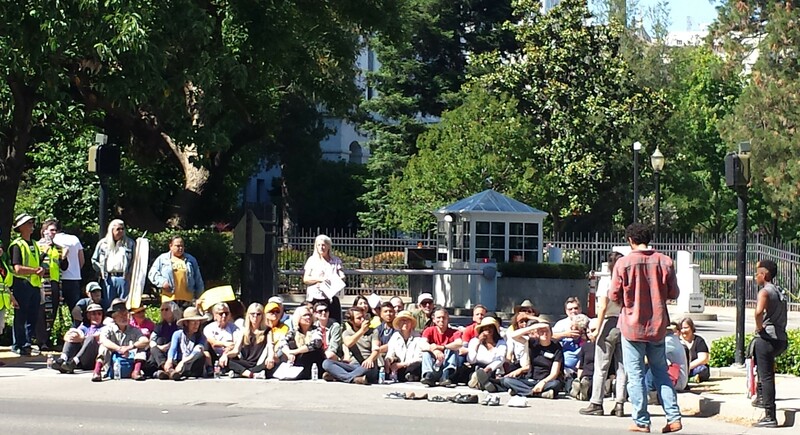 The PRC will be back in Sacramento for the May 29th Day of Action. Join us!! Contact us at info@prcsd.org for details. Here is the link to the national PPC direct action in Washington DC. 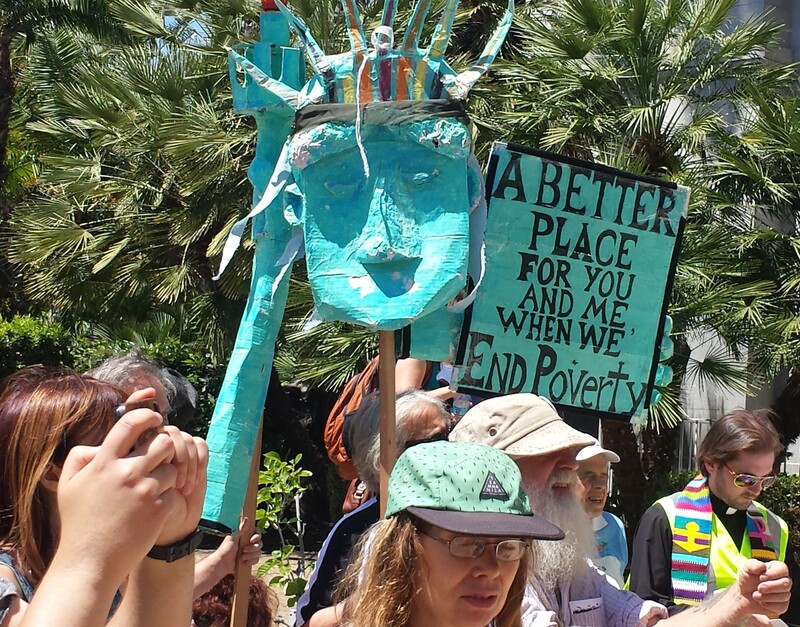 Follow the California Poor People’s Campaign here. Each of the 6 weeks has a theme based on the demands of the PPC, with actions planned at state capitols around the country for the Monday of each week. Please note: Due to Memorial Day Observance, Week 3’s Action will take place on Tuesday, May 29!! This was Week 1, and the theme: “Somebody’s Hurting My Neighbor: Women, Youth, Disabled, Children in Poverty, Right to Education” . The PRC will be heading to Sacramento again for Week 3 to challenge the immoral War Economy with a vision for a equitable, sharing economy. Contact us at info@prcsd.org for more information, or to connect with transportation and/or housing.